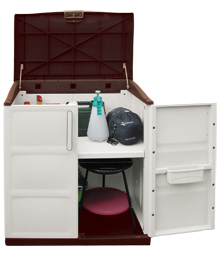 A compact waist high capacity storage system for all your garden tools etc., with useful 'Flip Up' lid that gives you access to working space/and top storage area adjustable shelf. 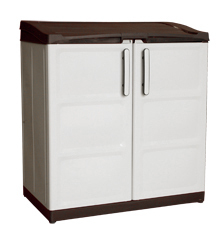 Pad-lockable doors and top lid,weather resistant, maintenance free.U.V. stabilised, plastic easy clip together assembly in minutes (door handles require scewing in place - screws supplied).